What’s wrong with this picture? I’m speaking of my assignment for this month’s issue of Tabletalk. Over the years, my articles have been generally written out of a concern to communicate content of a biblical or theological nature that I approach from the perspective of a student. This time I’ve been given the sobering assignment of writing about a topic, not merely from a biblical or theological perspective, but from a personal, anecdotal perspective. 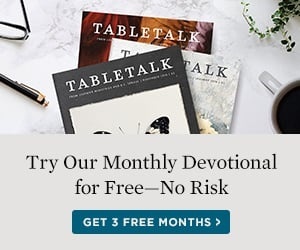 The editors of Tabletalk have asked me to write about grief, reflecting on how I have experienced grief in my own life and then commenting on how to deal with grief biblically as Christians should. Before I discuss personal grief, I want to comment on the nature of grief. When we speak of the reality of grief, we are talking about pain. The pain that we describe by the use of this word, however, is not the pain of a minor irritation. It is not the pain of a broken bone, a fractured leg, a pierced shoulder. It is a pain that penetrates the skin of a person and plunges to the deepest recesses of the person’s being. It is a pain that grips the soul with a vise-like pincer that brings with the pain an excruciating sense of mourning. We use the term grief to describe pain that assaults the deepest level of our being. We often use the metaphor of the broken heart, yet we know that hearts don’t break like a glass that falls on the floor or like bones that are shattered in an accident. The broken heart really describes a weeping soul, a soul that is cloaked in the darkest night. When we speak of grief, we speak about an emotion of which the Scriptures are profoundly aware. We speak of an emotion that was most poignantly manifested in the life and the experience of our Lord Himself. Jesus was described as a man of sorrows, acquainted with grief. His acquaintanceship with grief was not merely a sympathetic or empathetic awareness of other people’s pain. Rather, His experience of grief was a pain that He felt within Himself. To be sure, His pain was the result of His perception, not of His own shortcomings, but of the great evils that plague this world. We think of Jesus coming to the holy city, the city that He visited as a boy, the city that incorporated all of the promises that God had made to His people Israel, the city that was Zion’s holy hill. He came to that city, the city of promise, at a time when its corruption had reached its highest point. The nadir of unbelief was encrusted around the city of Jerusalem. When Jesus observed this city, He cried out in a lament, saying, “O Jerusalem, Jerusalem, the city that kills the prophets…. How often would I have gathered your children together as a hen gathers her brood under her wings, and you would not!” It’s the grief that Jesus experienced when He noticed those women weeping for Him as He was moved, pushed, and shoved towards the cross at Golgotha. He said to these bystanders, “Daughters of Jerusalem, do not weep for me, but weep for yourselves and for your children” (Luke 23:28). Our Lord’s grief was rooted and grounded in His compassion for a fallen world. On the other hand, when we experience grief, our grief is usually wrapped up with some kind of personal loss. We remember C. S. Lewis’ profound insights to this human predicament in his book A Grief Observed. In my own experience, when I think of grief, there are only a few personal recollections that force their way into my mind. The first and most painful was the grief associated with the death of my father when I was seventeen years old. This was the man who, humanly speaking, was the anchor of my soul, the rock of stability in our home and in my life. When he was reduced to frailty and became incapacitated by multiple strokes, and wasted away finally to death itself, I was driven to despair. The loss of this man, who was my greatest earthly hero, left a scar on my soul that remains even to this day. I also think personally of my sense of loss when my dear friend Jim Boice was taken home to glory in 2000. It was not simply the loss of a friend, but a loss of a comrade in an ongoing battle that left me with such sorrow. The pangs of that sorrow were multiplied by my sense of loss, not only to me, but to the church of our time. When this champion was removed from our midst, I wanted to cry with David, “O how the mighty have fallen.” I wanted to say, “Tell it not in Gath, publish it not in Ashkelon.” Let no one take opportunity at the passing of this man to rejoice in any apparent defeat to the power of the cross. Beyond those personal losses, the loss of friends, the loss of comrades, always bring to me a certain measure of grief. In my own heart, however, I know that nothing grieves me more than to see the Gospel compromised in the church. It’s not the wickedness of the pagan that breaks my heart. It’s the compromise of the Christian that grieves my soul. Finally, when I look at grief, as I experience it in my life and read of it in Scriptures, I know that with it always comes the clear and present danger of an emotion that can turn sour. Yet the emotion itself is perfectly legitimate. If we fail to deal with our grief, if our mourning goes beyond sorrow into bitterness, then we have allowed pain to abscess and become poison. We must examine the griefs we experience and take care that they never become the occasion for sin. They never did that to Jesus. We pray they won’t do it to us.